To start off our new building is bigger than our last one so there’s more room to be had. The building has an upstairs and a downstairs but we only needed one room for all our consoles. There were 3 TVs with a PS3, Xbox 360 and Wii. That wasn’t all we had though. Jordan also bought an SNK arcade machine which has over 1000 retro games and it had a re-usable coin box. Alongside the modern games it was fun to play some classic arcade games as well like Burger Time and Metal Slug. I also brought my Gamecube controller with Super Smash Bros Brawl, which was lucky because they didn’t have Brawl in the game collection. We had quite a big turnout for our first games night in the new building. I even invited a couple of my friends who brought their own games, The Simpsons Road Rage and Hit N’ Run for the Gamecube. Aside from that though we had a good assortment of multi-player games. 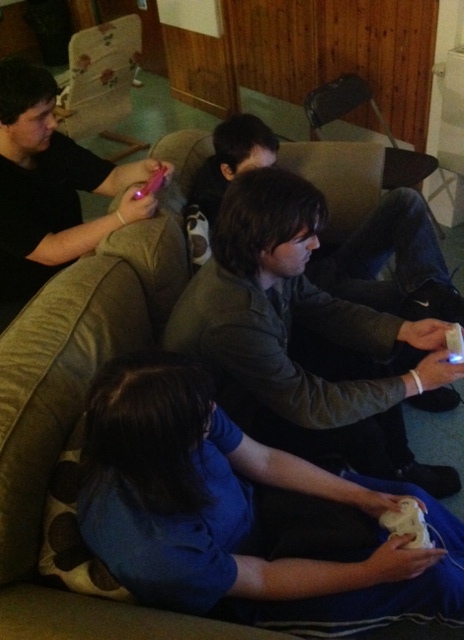 We duked it out on Super Smash Bros Brawl (more often than not James came out on top), and had fun 4-player action on Scott Pilgrim. The good part about that was that those who didn’t play the game got carried by the more experienced players. We didn’t play any Rock Band this time (gotta give it a rest for one night, eh?). Just like before we ordered Pizza and Chips for our food. And, what else? Oh yeah the new building has a soft play. You might think us childish for enjoying something for kids, but we can make our own fun. The most fun we had was thinking of the most daft and daring ways of going down the ramp e.g. gamboling down forwards or getting on 2 horses and doing what can best be described as a discount Grand National. Some minor injuries were sustained but nothing we can’t walk off. Overall did I enjoy the games night as always? Yes, yes I did. And did the new building’s bigger size benefit? Yes. More room allowed for more space for TVs and consoles, plus I reckon it would be good room for Rock Band (maybe next time). All in all it proved to be a great get-together for the Spectrum club and I can only look forward to having more games nights from now on.